"Awwwwwww, look who just transformed into a Panda!" The cutest button of joy just came into the room. And while some of the folks at the party might be thinking this is the newest zoo exchange from China, they'd be wrong. Totally off the mark! Because it's not a baby panda in the stroller, nope, it's your toddler. They're just all done up in the cutest panda outfit ever! Your little one can sure look like a Panda cub, and you won't need to stop by the zoo to achieve the look either. 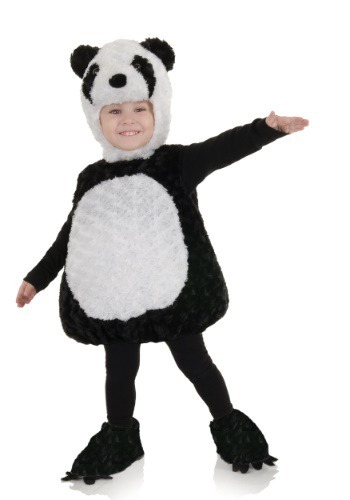 All you'll need to do is to get this adorable Panda toddler's costume! Your kiddo can become a puffy panda with this bubble bottom costume because it's totally Panda-riffic and ready for fun. And you won't even have to exchange your dollars into Yuans either, because we sell this costume worldwide. This cute as a boot costume is styled as a tunic and hood combination. Super soft polyester faux fur has fiberfill stuffing for added effect, and all you'll need to do to transform you little one from kiddo to cub is to attach the hood. It will secure around their chin with a hook and loop fastener strip, so they can show off all their panda moves right along with their big smile. Booties are also included, and you can use a black shirt and tights to style it as we have pictured.